As part of the Graham Bonnet Band's 2017 "The Book" tour in Japan, a three night special engagement and reunion of Alcatrazz was presented much to the delight of the Japanese hard rock faithful. In addition to this unique farewell performance captured on audio and video, Alcatrazz raided the archives and added some unreleased bonus tracks taken from the original sessions recorded in 1985, including one song, “Emotion” with a young Steve Vai on guitar. Bonnet is one of the true rock luminaries, despite the fact that he never thought himself a rock singer, as he fell into it with Rainbow, but common sense told him there was something here to be reckoned with, and after a fruitful but short lived stint fronting MSG, he put a band together in his own style and it was Alcatrazz, plucking two young and future guitar Gods into the spotlight in Malmsteen & Vai. You could even throw in a third in Impelliteri! Graham Bonnet is not one who ‘goes with the flow’ so to speak. He has always been to me, someone who is single minded and knows exactly what he wants. Take his spell in Rainbow for example, when told to grow his hair by Ritchie Blackmore, he came back with it shorter than before. He did it recently on tour, and he does it again here on this album, with many classics omitted for some lesser (but not by some, OK…me) favourites. 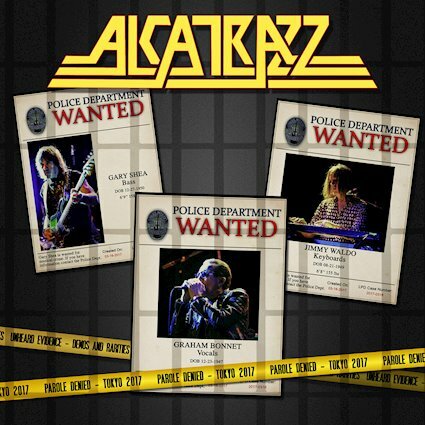 Anywho, lets face it, Vai nor Malmsteen were going to show for Alcatrazz, which is a shame considering its where they were both catapulted into the mainstream. Who needs a prodigy when you have axe-slinger Pesinato who carries off all the right notes in all the right places, which is no mean feat in itself. Alcatrazz wouldn’t be Alcatrazz without Graham Bonnet. I had my reservations in seeing him recently, down to my stupid perception of his age! He may no longer have the foghorn blasting vocals of the 80s, but bugger me, he can still belt out a note, when he should be retired, sitting near a beach reading the papers. ‘Too Young To Die, Too Young To Live’ highlights his vocal histrionics – at 70! Yes, bloody seventy! Other highlights are the song he wrote for his mum, ‘Suffer Me’; the song that introduces a whole generation to Alcatrazz via GTA, ‘God Blessed Video’, and main tune from their debut, ‘Island In The Sun’. Theres not a lot extra to say other than it’s a decent live album, but the real bonuses are contained within the package. Disc 2 is a side of demoes mainly from 1985. ‘Emotion’ is a typical Vai and shows what was to come on ‘Passion and Warfare’. Demo songs are always worth a listen, especially as you can mostly sense why they weren’t selected at the time, particularly ‘Imagination’ and ‘Please Call me’, but also show the beginnings as to what they morphed into ‘Ohayo…’ and ‘Blue Boar’. Finishing up disc 2 is ‘Set Me Free’ from ‘Line Up’, and last on the list is a demo of ‘Rider’ from ‘The Book’.